Okay, all you jive turkeys, turn on your listening ears. Your days of shouting "Holy guacamole!" are over. There's a phat new catchphrase all the kids are using when they're not fidget spinning on the Snapchat with their pocket computers. TIME Magazine has proclaimed that "hold my avocado" is "the viral catchphrase millennials have been looking for." Millennials and avocados are truly the Corey and Topanga of generational coupling. They'll be together forever, or at least until the show gets canceled. The phrase comes from Google Ventures partner and self-proclaimed "Gen Xer" Ken Norton, who tweeted the phrase earlier in the week. The phrase has actually caught on, and it even got its own "moment" on Twitter. It hasn't exactly caught on as a catchphrase, though. Time: "Hold my avocado... the catchphrase Millennials have been looking for." Millennials: "Oh, that magazine from the dentist in the 90s." "hold my avocado" is the new thing, it means "you olds didn't have it that much different", and I completely support it. The only time I would tell someone to "hold my avocado" is when I'm preparing a cobb salad. 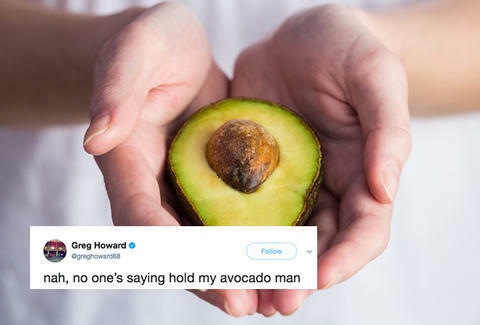 In the end, "hold my avocado" is everywhere right now. Just in a slightly different way than predicted.